Sound. Correct. Trainable. These traits are what we look for in a dog. 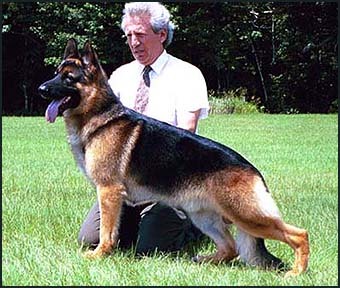 Add to that excellent structure, beautiful color, and a pedigree that is full of those traits, and you have a dog with the potential to become a future sire. We have found all that and more in our newcomer, Jesse. Lovely to look at. Smart. Quick to learn. Marvelously outgoing and social. 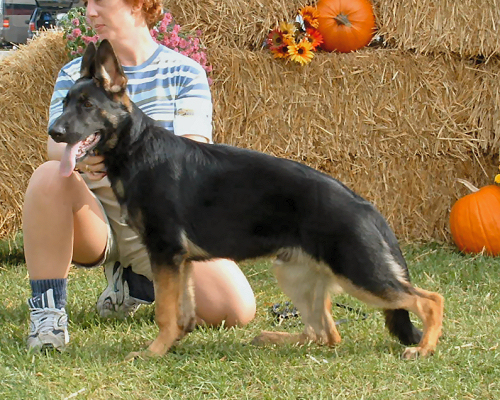 And being a son of "Dallas" - the top winning Best in Show winner and Select Excellent, AOE award winner, he has the pedigree to back it up. We welcome Colleen Kittmer of FivStarr GSD's as sponsor of Team Jesse and are elated that she joined us as Jesse won his first points towards his Canadian Championship by going BEST OF BREED and Puppy Group 1 from the 6-9 months class. Showing is so much more fun when you can share it with friends. We know Team Jesse will have many more successes as this handsome young male matures.